Panteón Municipal La Chaveña, Ciudad Juárez. Photo by Molly Molloy. On October 31, El Diario de Juárez said the municipal cemeteries were dying. On the Friday before Dia de los Muertos, I walked in the oldest cemetery — La Chaveña. It’s 179 years old. More than 75,000 people in the Paso del Norte have come to rest here. Graves are chiseled into hard ground in the western hills of Juárez and only cactus, ocotillo and bits of spiky brown grass adorn the stones. Someone planted a palo verde sapling in a cement-lined water holder on a newer grave. This tree grows in the driest land of the Chihuahuan desert. It was a workday in the city and there are few recent burials here. A couple of workers poured cement around a monument on one old grave and as the sun started to set after 5 o’clock, a couple arrived with three young children and entered through a yellow gate in the chain link fence. A kindly dog followed us down the dusty path. My friend and guide — photojournalist Julián Cardona — went to high school in this neighborhood and knows every inch of Juárez. He said that when the city expanded a road along one edge of the cemetery in the 1990s, the oldest bones were dug up and moved en masse to another corner of the burial ground. Today, small metal crosses mark graves remaining near the boundary wall. The newer San Rafael cemetery may have space to last only another year. During the recent hyper-violence in Juárez (2008-2012), San Rafael hosted more than 20 funerals each day. I looked back at Octobers 2007-2016. Monthly homicides rose from 29 in 2007 to 359 in October 2010 — the highest monthly toll in the history of the city, more than 11 people murdered each day. 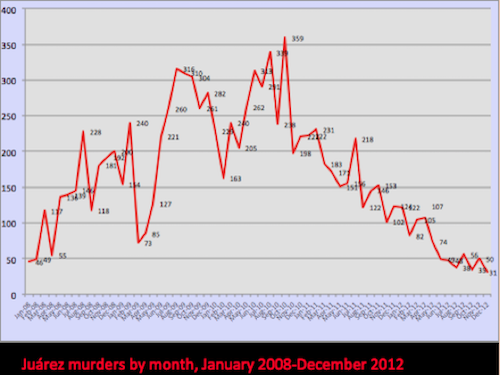 Homicides dropped back to the normal range by October 2012 and lower still for the next three years. Then, after state and local elections in July 2016, homicides in Juárez shot up — the sharpest rise this October, back to an average of three murders per day. On October 28—the day I walked through La Chaveña — eleven people were killed. Other than a few municipal police trucks speeding down a wide avenue after dark, I never saw a sign of violence. That is what it is like to visit Juárez. 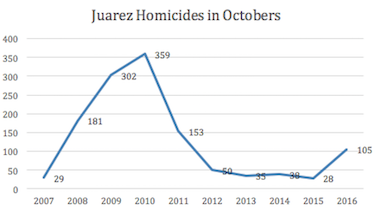 This week another headline screamed the hard truth: “October the most violent month in 3 years.” At least 105 people were murdered in Juárez during October 2016—a terrifying flashback to brutal levels of violence experienced a few years ago. City officials attribute the sharp rise in homicides to expansion of the local methamphetamine trade and that small-time dealers are killing each other — an explanation that effectively criminalizes every victim. Experts say that new cartels are fighting for territory in play after the arrest of Joaquin Guzman—the famous El Chapo — now living in isolation in a Juárez prison and (it is said) soon to be extradited to the United States. 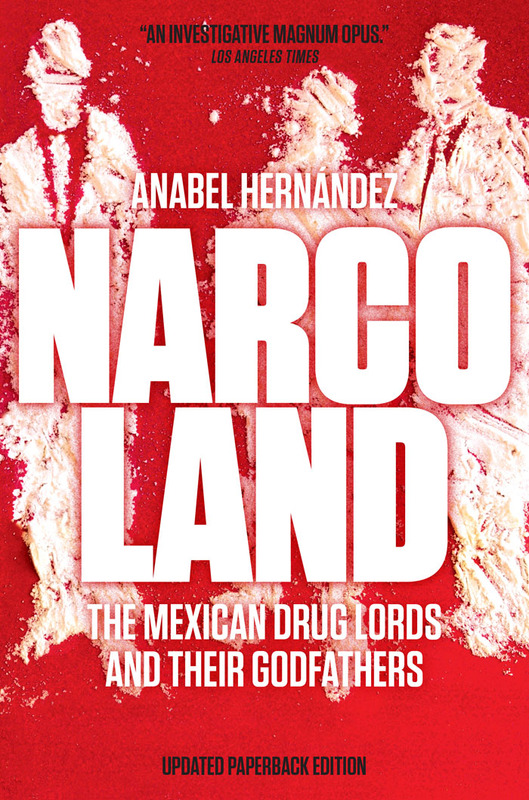 But the criminal economy in Juárez depends on more than one “narco of narcos.” And 100 dead bodies are not “a perception.” The retail drug business may employ several hundred thousand people in the city — possibly as many as work in low-wage maquiladora jobs. People pay to protect neighborhood drug territories and they must pay to protect legitimate businesses also. 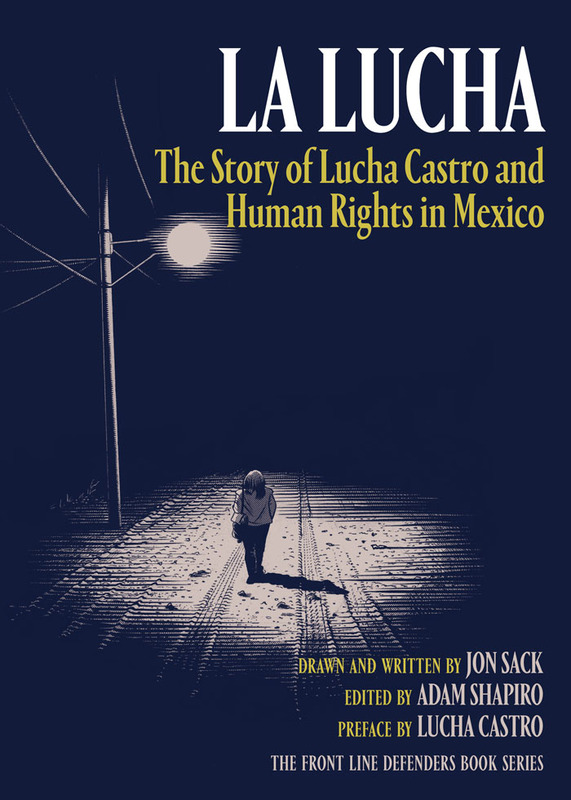 Municipal, state and federal police, and Mexican military personnel run extortion rackets all over the city in order to get their share of the profits. Violence is an essential element of the business. People who do not pay are killed. And it is not just Juárez. 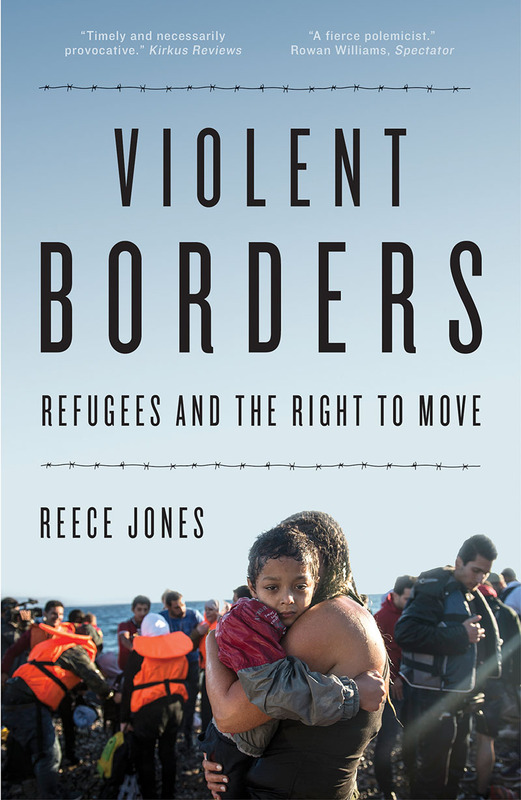 The hyper-violence that shocked the border city beginning in 2008 has leap-frogged across the country of Mexico with new atrocities revealed nearly every month. Homicides are rising again nationwide after a slight decrease in the past two years. From 2007 through September 2016, more than 200,400 people have been murdered or disappeared in Mexico and there are numerous reports that the Mexican government has obscured homicide data for at least two decades. On October 21, 2008 during the first year of extreme violence, this shocking headline appeared in El Diario: “Four decapitated; heads sent to police.” What seems horrifically normal now was unprecedented then. Crime reporter Armando Rodriguez emailed me that it was like a low-budget horror movie. A few days later I asked him to verify the homicide tally I was keeping. My email ended: “cuidate” / take care. 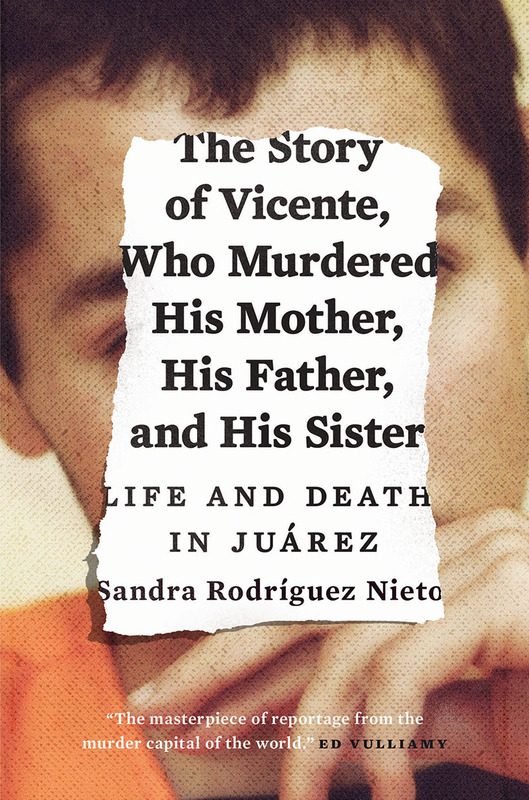 On November 13, 2008, Armando was shot to death in front of his house—his murder among the thousands of unsolved crimes. He is one of the 12,962 murder victims in Juárez since 2007. 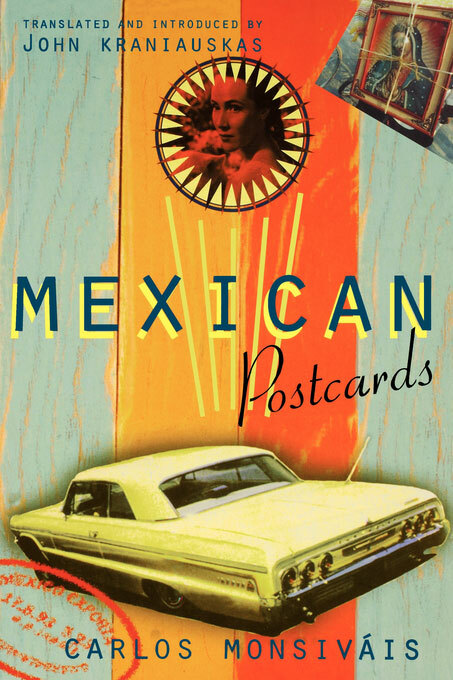 Molly Molloy is a librarian and Latin American specialist at New Mexico State University in Las Cruces, NM. She is the editor of the Frontera List, a forum on border issues. 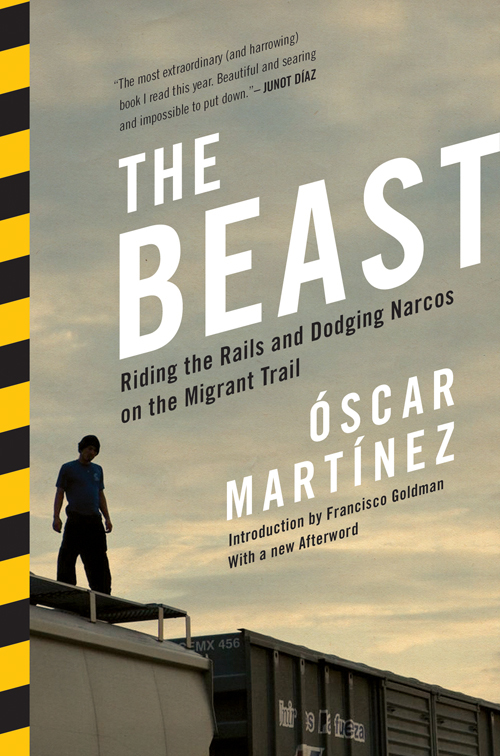 Since 2008 she has documented homicides in Mexico and co-edited El Sicario: The Autobiography of a Mexican Assassin with Charles Bowden (Nation Books, 2011) and has written for The Nation, Phoenix New Times [here and here], Narco News Bulletin, Small Wars Journal, and NACLA.